So if you’ve found yourself here, at The Bottom Drawer Bridal, chances are, you’ve started the search for your dream wedding dress. And you know what? 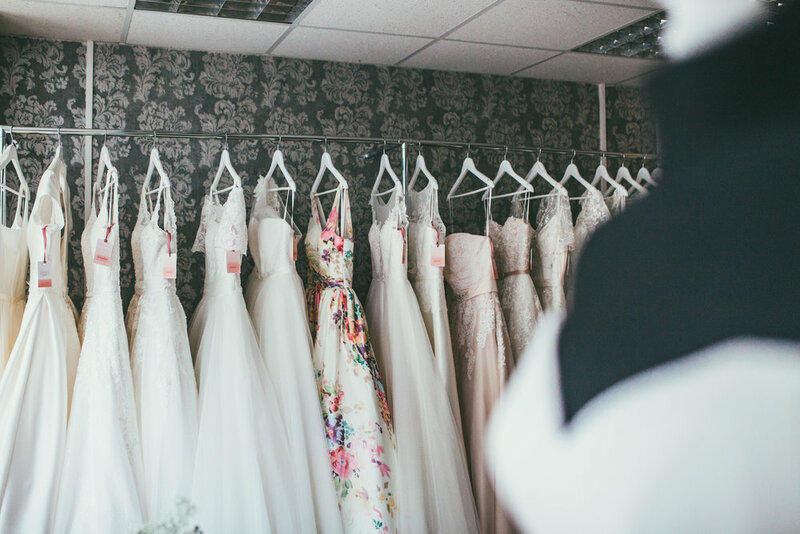 You’re in the right place as today i'm revisiting my top tips for a stress-free wedding dress shopping experience. Finding 'the one' is probably one of the most exciting parts of wedding planning, if not the most exciting and it’s the perfect excuse to feel like a princess, with a bit of modern day dress up. 1. EVERY BRIDE IS DIFFERENT. And that’s different in every aspect of wedding planning, just because your BFF bought the first dress she tried on, it does not mean that you will too. You may well end up trying on more dresses or even going to more appointments, whether that’s at the same boutique or trying different one. Don’t let this get you down, focus on you, your appointment and more importantly YOUR DRESS, forget about everyone else and their experiences. Look at dresses online and in magazines to try and get a sense of the styles you like the look of. Create a yourself a Pinterest board, stick pictures to your mirror — whatever helps you figure out what you like. Are there certain designers you keep going back to? Make sure you follow them on social media and keep yourself up to date with future styles along with where their stockists are. 3. BEWARE OF THE ‘INSTAGRAM BRIDE. Relying too much on a Pinterest fantasy can backfire. Just this week, I had a Bride ask me if I’d ever been on Instagram as she felt I was ‘missing something’ Please remember a lot of these images are styled, the dresses can often be one off catwalk samples! Make sure when looking online, you know where the images are coming from, a lot of US & Australian designers aren’t available in the UK. This is probably the most important on this list. Be honest with yourself and establish how much you're able to spend on the dress before you make your appointment. A lot of Bride’s will tell me they don’t really have a budget but when they then step into a gown and fall in love, the £3000 price tag is too much. Even if you don’t have a set budget, try and have an idea in your mind what you would like to spend. Is £2k just too much or would you be happier at about £1500? It's good to have a little buffer in there so if you do fall in love and it’s £1750 then its not going to be too devastating to the purse. DON’T FORGET, you'll need to pay for alterations, accessories, shoes, a veil etc. Firstly bare in mind, you may need to schedule your appointment at least a few weeks in advance, especially during busy season! Although Weekdays may well be easier to book than Weekends. You'll need at least 3 months before the wedding for the dress to be made, but 6 to 8 months is the average; if you give yourself a year from appointment to wedding; you won't feel rushed. 6. BE OPEN MINDED AND WILLING TO COMMIT. Make sure you keep an open mind as to what you are looking for, I mean of course, keep your research with you, but if that style doesn’t suit your shape then don’t panic! Go to your appointment with the positive attitude that you will find the one and you will enjoy the experience so much more, go in with the attitude that you probably wont find it and you’re setting yourself up to fail before you’ve even walked in the door! 7. DON'T TAKE EVERYONE WITH YOU. You'll only feel outnumbered and overwhelmed by all the voices and opinions. It's really important to only bring those with you whose opinion you truly respect and want. 8. BE COMFORTABLE WITH YOU. What do you like on your body? Legs, Cleavage? Arms? Know what works for you in your day to day style and we can incorporate that in your Bridal Style. It is always best to enhance assets that you love and feel comfortable with - it is best not to be over - ambitious and chose something that you will end up feeling awkward in on the day. 9. BRING A PAIR OF HEELS IF YOU KNOW WHAT HEEL HEIGHT YOU WANT. If you are not used to wearing heels it may be worth considering wearing flats on your wedding day too, otherwise you may end up with sore feet and no bride wants that! However, if you insist on wearing a pair of stunning skyscrapers ( it is a VERY special occasion after all!) - do bring a pair of heels that will be similar height to ones you'd like to wear on the day, so the seamstress can make sure that your gown is correct length. 10. WEAR THE RIGHT UNDERWEAR. Not 100% necessary at your first appointment, but helps for further fittings. 11. DON'T WORRY ABOUT PHOTOS AT THE APPOINTMENT. The dress you try is a sample, sample sizes NEVER fit properly!! Remember that your dress will be made FOR YOU and your measurements! 12. WHEN YOU KNOW, YOU'LL KNOW. Some girls cry, some get giddy and some just simply grin from ear to ear, everyone’s different and that mean’s everyone’s reaction to ‘the moment’ is going to be different. Just don’t force it, When you find the right one, you're not going to want to change anything about it because you already love it when you look at it in the mirror, and know that it’s only going to get better every time you put it on between now and the wedding. 13. DON'T MAKE WEIGHT PROMISES THAT YOU CAN’T KEEP! Some brides will insist on getting measured for a smaller size than what they are when they try on the dress, but even with the best of intentions they don't reach their goal. Not only is this going to be heartbreaking, it’s going to be disastrous for your wedding plans and wreck havoc with your budget. 14. YOU'LL HAVE TO SIGN A CONTRACT. Don’t freak out, but a wedding dress is a pretty major expense for the majority. And because Wedding dresses are be very expensive, made-to-order pieces, both the Bride and the Boutique need to be protected. 15. YOU'LL SAVE MONEY BY GOING TO A TRUNK SHOW/DESIGNER WEEKENDS. Boutiques will often offer discounts and you'll be seeing more dresses from that designer than the boutique usually carries. You might also meet the designer! Chances are you’ll be getting a knockoff from China; you might end up losing money in a scam, and, or getting a dress that's not what you expected.